Klein Sun Gallery is pleased to announce Observer, a solo show of paintings by Wei Dong, on view from October 13 through November 12, 2016. Growing up under the repressive sociopolitical environment during the Cultural Revolution, Wei Dong’s early works are profoundly shaped by the political legacy of this period of the time. Over the course of his career, the artist’s oeuvre has departed from the grotesque imagery of voluptuous women and a deformed reality in a political context. Discovering a new pictorial language, the artist has paired men and women with animals, disclosing a secretive and sensual intimacy that results in a voyeuristic aesthetic. In Wei Dong’s earlier works, this kind of intimacy is often decoded in anachronistic scenes with oddly mismatched elements and protagonists. My Trouble with Gentleman (2011), for example, shows the corner of an interior decorated in ancient Chinese style, and a woman standing in front of an old man who perhaps belongs to dynastic China. Seen from the behind, only the woman’s full-grown body and porcelaneous skin are visible, it is as if her identity has been erased or solely decided by her naked flesh. Powerless and vulnerable as the woman may appear to be, the painting is subverted by a pair of scissors, held by the woman from the back. The tightly secured scissors opposes the skeptical expression from the old man, which not only builds up a tension but also issues a warning from the seemingly defenseless woman. The uneasiness and ambiguity in Wei Dong’s earlier work has continued, and has led him into more perplexing and metaphoric compositions in his recent paintings. 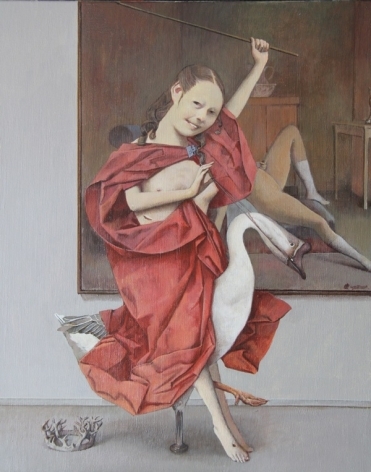 In My Pet (2016), the artist depicts an effeminate figure sitting in the center of the piece, a goose is in his arm, looking to the left. Dressed in western and classical apparel, the figure looks languid and serene. On the right, a miniature black cat turns its head towards the figure. Situated respectively as such, the goose, the figure and the cat are as if forging a connection among each other. The indifferent facial expression of the figure, along with the goose that perhaps carries out a phallic connotation, mystify the painting even more. Presenting the artist’s recent focus in a multi-layered and obscure language, Observer shows Wei Dong’s sophistication in subverting and complicating his visual imagery. In recent works, the artist explores an interweaving relationship between the female and male genders as well as the exclusive connection between males. The artist’s inspiration is revealed in the perplexing and peculiar narrative, illustrated throughout this exhibition. Wei Dong was born in Inner Mongolia in 1968. He graduated with a BFA from Capital Normal University, Beijing, China in 1991. He currently lives and works in both Beijing and New York. Wei Dong’s recent solo exhibitions include, The Adventure of Ugliness: Wei Dong 1993-2015, Today Art Museum, Beijing, China (2015); Crossroads: Wei Dong, S|2, Sotheby's Hong Kong Gallery (2015); and Paintings & Works on Paper, Galerie Frank Schlag & Cie, Essen, Germany (2014). His artworks are included in permanent museum collections including Philadelphia Museum of Art, Fine Arts Museum of San Francisco de Young, Denver Art Museum, and M+ Sigg Collection, Hong Kong. For press inquiries, please contact Rui Tang at the gallery (212.255.4388) or via email at rui@kleinsungallery.com. For all other inquiries, please contact Nicole Aiello at the gallery (212.255.4388) or via email at nicole@kleinsungallery.com. Non-commercial and non-profit educational site produces a one-page spread of Wei Dong's solo show "Observer" at Klein Sun Gallery. A sneak peak of Wei Dong's solo show "Observer" at Klein Sun Gallery.